Does the world outside seem a little bit murkier than usual? Top Window Cleaners will let the light back in! Get the professional window cleaning Brent households rely on with one quick call today, and you'll start benefiting from high quality cleansing delivered by a trained and vetted team. A highly effective clean for all glass - suitable for domestic, commercial and even industrial properties. Customer care and support provided around the clock. Booking slots that meet your needs - call us in after work hours or at the weekend. Free quotes on the fantastic value for money our expert window cleaning services offer and transperant price rates. Insurance protection as standard - we value your peace of mind! Broad coverage - we cover absolutely every area in London and the surrounding counties. 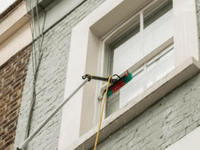 Simple-sounding but highly effective, our technique for professional window cleaning in Brent uses the handy water-fed extension pole to bring purified water into contact with your dirty glass. The water starts out in a tank in our vehicle - which is why we'll need parking set aside for us within thirty metres of the windows you want us to clean. The water is then purified as it reaches our extension pole, and sprayed out onto your windows. Our poles reach 23 metres into the air, meaning we can clean up to the fourth storey of your home or business premises whilst remaining firmly on the ground. This lets you keep your privacy, and lets us keep our eyes on the cleansing process. A natural, smear and mineral deposit-free clean makes purified water the ideal choice for your windows. 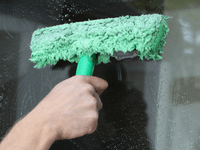 Sanitise your windows with professional home window cleaning. Have your high-rise office windows cleaned by trained cleaners. 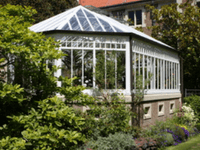 Clean the conservatory's glass no matter its type or structure. All you need to do to reach the helpful support team here at Top Window Cleaners is to pick up the phone and dial 020 3404 9775. We keep our phone lines, online contact form, and chat facility staffed by live advisers 24/7 throughout the week and at the weekend, so you'll be able to get your free, no-obligation quotation on the window cleaning services you need whenever you choose to call!